Audio Physics speakers have been a long-time favourite of mine. Manufactured entirely in Brilon, Germany, their attention to detail, finish, presentation and tonal balance rank with the best available. My reference speakers for the past 2 years have been their flagship model “ Cardeas Plus +”. 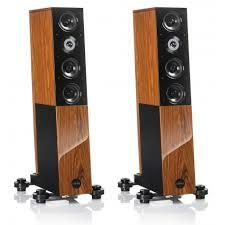 For more information on this superb speaker, please click here. I was recently advised by the Australian Importer, Radiance Audio Visual, that a “Jubilee Limited Edition “ version was to be available and that they were limited to 30 pair worldwide. Naturally, being an ardent supporter of the brand, I put my hand up for a pair. Considering, the superb performance available from the Cardeas Plus+, I wondered how this LE version would better that model. The LE version arrived a week ago, Serial number 2, and after a customary burn in period, I sat down to do some serious auditioning. Whilst there is a sonic familiarity between the Cardeas Plus + and the LJE let me say from the outset that these speakers bettered the Plus + in every dimension. And so they should, considering they cost 50% more. My listening room is quite large – 10 meters by 6 meters, treated with Vicoustic Super Bass Extreme Absorbers and very neutral in tonal character, additionaly I do listen to my music at realistic levels. I am not a reviewer and I will leave it to the experts to justifiably praise these speakers for what they are. Let me in a nutshell state that they are a true full range speaker, with a large three dimensional soundstage, (likely aided by my room), the sweetest and most cohesive sound I have heard with dynamics to die for, superb transparency and tonal balance, detailed but never etched, revealing to even the most minute whisper or symbol. A friend dropped in to listen to these speakers. He was quite familiar with the Plus+ model and thought they were the best he had heard. After a short listening session, he asked “How can you ever improve on this “. That about sums it up.